You really can't even believe how it is to live in Durango, Colorado. At 6800 feet of elevation Durango is located right in the San Juan National Forest, and the San Juan Mountains, What a view. If you like Mountain Biking, Skiing, Hiking, Hunting, Fishing, Motorized Trail Riding, and too many more to even name, This is the place to be. A major tourist stopover, Durango is a busy little town in the summer, and attracts a large ski & snow board population in the winter. Durango has a centrally located college, Fort Lewis College which houses a little over 4000 students. The Animas River runs through the middle of Durango, Rafting and Kayaking, as well as tubing are commonplace, there are trout in the river here, So there's plenty of fishing within walking distance of town. You can take a step back in time just by walking downtown and taking the Durango-Silverton Narrow Gauge Railroad, which runs along the Animas River to Silverton, Colorado, or take the time to see the Strater Hotel. in Durango since 1887, the hotel is furnished all Victorian, it's a piece of Durango that you can't pass up. 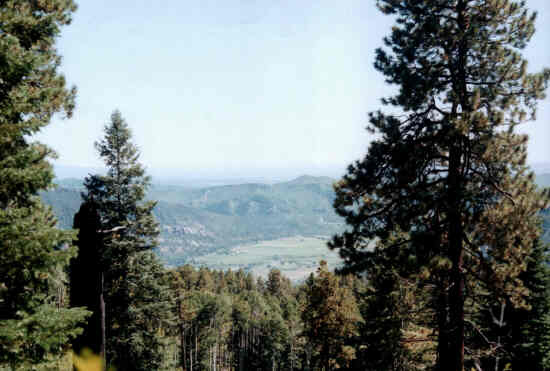 Animas Overlook is within 20 minutes of Durango, you can be transported into a different world where Durango, looking down from above can be hidden by your hand at arms length. Well we really can't with good conscience not go to the facts, this was the original living Durango page, just the facts. Here we go!